If you haven't played a pinball game from Zen Studios before, it's essentially a pinball arcade portal. The game is free and comes with a single table, Sorcerer's Lair, with other tables available for purchase, primarily in themed packages that include two to four tables each. The tables are all original designs for the game so don't expect any licensed classics from the golden age of the silver ball. However, the table designs in the game are all pretty good and include licensed tables from properties like Star Wars, Marvel, and Fox Animation. New tables are released several times a year, so you'll always have a variety of new tables to choose from, and any table can be demoed before purchase. If you've played one of the previous games, then all of this is still essentially the same as before, and if one of those games was Zen Pinball 2 on the PS4 you'll be able to import most, if not all, of the tables that you purchased with that game. With any pinball game review you need to start with the physics, because if a pinball video game doesn't get that right it's worthless. I've played my share of pinball, both real tables and video game versions, and Pinball FX3 nails the physics like no other video game before it. The ball feels like it actually has weight as you send it back up the table with the flippers, and every ricochet and bounce looks perfectly accurate. The ball is not following pre-programmed tracks across the table, instead giving itself over to the laws of physics in the same way a real ball would. You can even give the table a nudge in different directions, to try to get the ball to drop in the lane you want it to or to make a desperation save when the ball is making a high speed beeline for the gap between the bottom flippers. While the physics is strictly real-world, the game also takes advantage of the fact that it's a video game. You'll see numbers indicating your score float out of the bumpers, targets, and lanes as you hit them, much in the same way as you'd see in an RPG or fighting game each time you land an attack. Some tables feature 3D animated characters on the edges of the tables that react to your play and sometimes leap into action while you're trying to complete a mission sequence. You may even trigger video game style mini games that take place in a separate space from the table itself. All of these things add to the game experience without detracting from the pinball play itself. 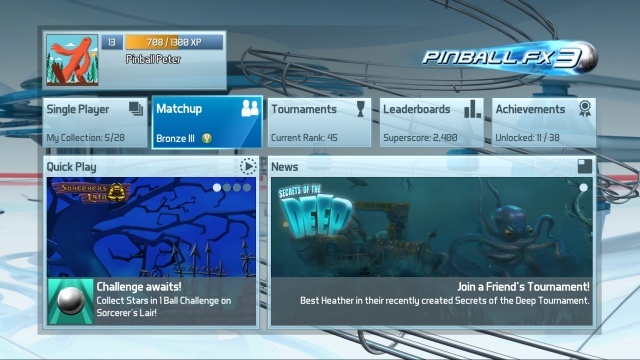 All of this was part of the Zen Pinball 2 experience, so what has changed with Pinball FX3? 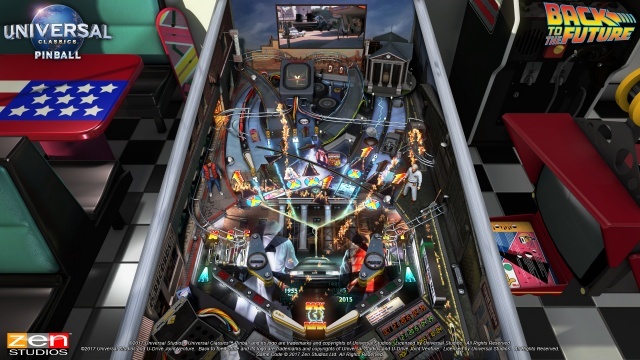 Well, Pinball FX3 adds new modes of play to the prior game's pinball and tournament modes. Each table includes three challenge modes, each of which challenges you to get the highest score that you can in one minute of play, with only a single ball, or by reaching set score interval levels within time limits. Completing these challenges will reward you with bonus powers and perks that can be enabled when you play the table in standard mode. These include the power to briefly rewind time, increase the length of combo timers, and increase bumper score values. Pinball purists will undoubtedly balk at such perks, but for them there is still a straight mode of play that doesn't allow perks or powers and has its own separate leaderboards. I like the new challenge mode, not so much for rewards but because they each do provide their own unique challenge that adds some variety to the game. Pinball FX3 supports weekly tournaments like its predecessor, but it also adds the ability for players to create custom tournaments to share with the public. Set the table and GOALS and then put it out there to see who earns the best score before the tournament closes. You can also participate in these tournaments without ever making one yourself. It's easy enough to browse the tournament list and find one that interests you. As much as I love the game's tables, the menu system's look and feel is really plain and simple. I know that it doesn't really have any effect on the gameplay, but it does on the overall experience. The tables demonstrate that Zen Studios has some very talented artists and designers working for the company and I'd like to see them turned loose on the game's interface as well. My only other complaint with the game is that teaching players the missions and goals on a new table needs to be incorporated into the game. Each table has a text-based guide that you can find in the menus for the table, but trying to memorize all of that while picturing actually playing the table is an exercise that is more difficult than it should be. An interactive tutorial mode for each table would go a long way towards making them more accessible to new players and bringing veterans up to speed on a new table a lot faster. Overall Pinball FX3 is an enjoyable experience. The tables all look fantastic and play quite well, and the pinball physics is unmatched in pinball video games. At the very least take the time to download the game and take its free table out for a test drive. You just may find yourself getting hooked on the game. Final Rating: 90% - Pinball FX3 is well worth taking out for a spin.